However, for larger or frequently recurring events, creating a dedicated Twitter profile is a great way to engage attendees if you have reason to engage with them year-round. Whether it’s your name or the event name in the profile, use it much like the Facebook fan page: to share event information as it unfolds as well as engage with attendees. 8Reach out to stakeholders and influencers to help spread the word. It’s really easy to search for people on Twitter, and most influential people keep their profiles public. Reach out to them over Twitter to let them know about your event and encourage them to help spread the word. If they think it’s a great event, they will most likely share it with their followers because sharing valuable information is the best way for them to stay relevant with their followers. Get people that are involved with the event as talent or speakers to engage as well. Call them out in tweets and they will often retweet what you have to say, adding a personal note of their own. 9Post the event to LinkedIn. At a bare minimum, you can create an update that includes a few words on why you are excited for the event and a link to your Eventbrite page. We’ve seen this drive some traffic for event organizers, especially for professional events. Posting the event to LinkedIn can generate additional traffic and interest for your event. It’s relatively easy to set up: just go to the events section of LinkedIn and click on the “Add Event” tab. Enter in your event details, including a link to the Eventbrite page where they can buy tickets. When you publish the event, it automatically sends it out to all your LinkedIn connections. Seek out LinkedIn groups that are relevant to your event and let them know about it as well as sharing the event with specific contacts, which LinkedIn easily lets you do. If enough people respond that they are interested or attending, your event will bubble up to the top of the Events area and drive additional traffic. 10 Build your own community. For the biggest and most complex events (typically conferences), building your own community may make sense. However, you really need to consider the value that you are bringing when you ask people to set up a profile and participate in a new community. 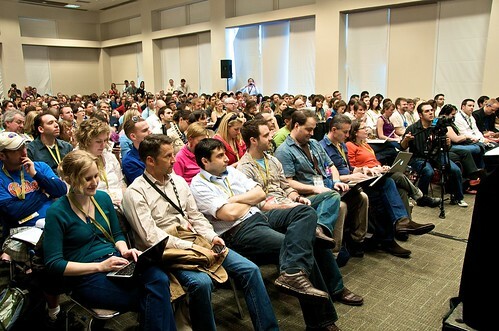 SXSW built a community where members can nominate panel ideas and vote on them, put a custom schedule together, and participate in different event-related discussions. There are solutions like Pathable that let you brand their pre-built community platform and integrate it into your site so that you don’t have to build the functionality from scratch. This strategy is only for those committed to putting in the time and effort needed to encourage participation and build a community that brings value beyond just threaded discussions. Have your own suggestions? Please share in the comments! Hi can you tell me what is the most efficient way to post a message I have written on my LinkedIn account to my Twitter account? We have recently launched a new event promotion website where anyone can post events for free. Thanks for Informative sharing, The status update field on the profile to make company announcements, offer special deals, give tips and share links really helps a lots.